Supporting communities to be vibrant places to live and work is at the heart of what we do. We support people and organisations to make change happen as well as sustain what works. We know that being able to get help with accessing funding, strengthening your governance and developing new projects and initiatives is one of the priorities whenever we ask organisations about what they need from us. Community organisations of all kinds play a vital role in maintaining the healthy and vibrant communities we all want to live in. We can help your organisation to develop, thrive and to achieve your aims whatever the size or location. We offer a wide range of help, advice and support backed up with many years of experience and expertise. We believe that social enterprises have an increasingly important contribution to make to our communities. We can provide you with support to make that contribution a reality. Parish Councils have a unique and challenging role. We can provide specialist advice and support to help Parish Councils ensure their communities are vibrant places to live and work. 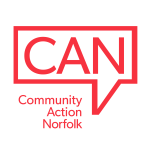 Community Action Norfolk can support you to engage effectively with VCSE organisations and communities. We can help improve your understanding and insight as well as capacity to develop and deliver community led solutions. We work directly with funders, commissioners and grant providers to help maximise the benefits to communities, charities and organisations in Norfolk. We believe that the VCSE and private sector need to work together, and often have more in common than they think. We work closely with businesses and business groups as part of our mission to build a stronger, fairer Norfolk.